unhealthy sugars in juices and sweetened drinks. sugary drinks to water can be unimaginable for some due to its tasteless flavor. carbohydrates, and absolutely no sugar, sweet drink alternative. Why Buy The Right Cup? perceives the flavor of normally tasteless water. eliminates excessive plastic bottle waste. ✪ The Right Cup is reusable up to six months so it also saves you time and money. enjoy all the flavors or share with your family. Show you care this holiday season with a thoughtful gift of The Right Cup. ✦A PERFECT SOLUTION FOR INCREASING WATER CONSUMPTION AND IMPROVING HEALTH! Great for kids, adults & diabetics. Drink less fruit juices or drinks sweetened with erythritol, saccharine, or organic stevia. 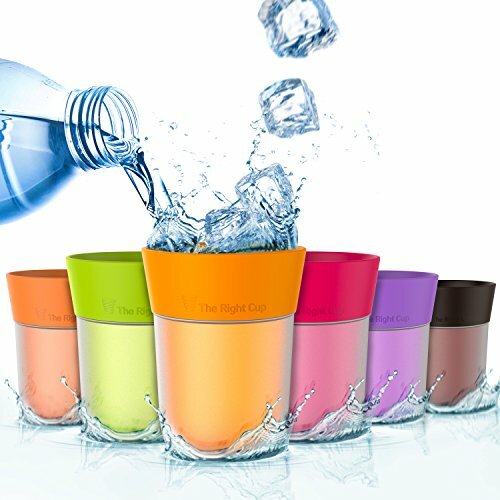 Food-grade flavors built into the cup to produce a likable water-drinking experience. Since it's just water, it's zero calories. Perfect for losing weight and increasing hydration. This is not a magical cup that turns water into juice though it can create a better drinking experience. ✦ THE EASY, LOW-COST, HASSLE-FREE WAY TO ENJOY DRINKING WATER. Simply add regular tap, mineral, or soda water to our BPA-free flavor-scented cup. The Right Cup works through the sense of smell which enhances the flavor of tasteless water just by adding water. With The Right Cup, there's no need to go to the trouble of buying and cutting up expensive fruit or vegetables to flavor your water; simply add the water for an easy, delicious, and healthy serving of water. ✦PORTABLE, CONVENIENT, AND EASY TO USE. With the demands of life, it's sometimes hard to drink enough water. Take The Right Cup wherever you go-it's perfect for post-workout hydration or for ensuring your child gets proper hydration even when you're on the go when you're most tempted to buy sugary drinks. Made of recyclable plastic comparable to the size of a can of soda or iced tea, The Right Cup is built for portability. Wherever you are, all you have to do is add water! ✦DRINK MORE WATER, SAVE MONEY AND MOTHER NATURE. In addition to providing a healthy solution to hydration, using The Right Cup helps the environment by reducing your carbon footprint and eliminates excessive plastic bottle waste. The Right Cup is reusable up to six months which can save you a minimum of $150 in six months by eliminating one daily purchase of an energy drink and flavored sodas like SodaStream (Based on $1/day expenditure of sports drink). ✦IRON-CLAD, NO-RISK, 30-DAY, 100% MONEY-BACK GUARANTEE. We're so confident you will benefit from using The Right Cup we're offering a no-questions asked, full-refund policy eliminating all the purchasing risk. With our dedication to customer satisfaction, we've eliminated the risk entirely so go ahead and buy one of every kind so you can enjoy all the flavors rotating them or sharing with your family. This is also a great healthy gift idea for even the most difficult to buy for person. If you have any questions about this product by The Right Cup, contact us by completing and submitting the form below. If you are looking for a specif part number, please include it with your message. Sertodo Copper, Hand Hammered Pure Copper Gangotri Ayurvedic Water Pitcher with handle and lid, 70 fl. oz.